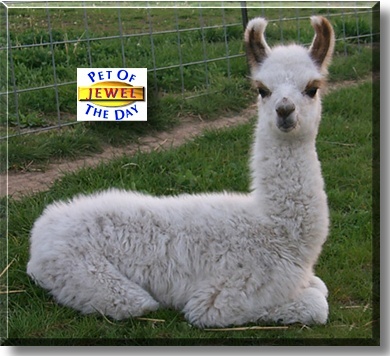 Hello, my name is Jewel and I'm a baby llama! I was one month old on May 6. My mom loves to teach me everything that I will need to know when I grown. I'm a very quick learner and mimic everything that she does. Oh, the dusting spot was the most fun! My person says that llamas are wonderful animals and have many uses; packing, pulling a cart, fiber, showing, 4H, public relations, and as companion animals. Mmmm, I wonder what she has in mind for me?